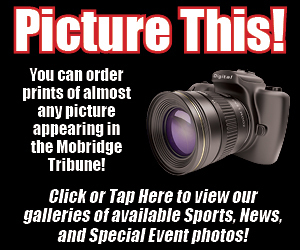 Trailing by four early in the fourth quarter, the Tigers scored 12 straight points to avenge a loss from two weeks ago and defeat McLaughlin 55-50 at Mobridge-Pollock High School Gymnasium on Tuesday. McLaughlin scored the first four points of the fourth quarter to take a 46-42 lead. The Tigers tied the game on baskets by Noah Feyereisen and Bryston Goehring. Then Caden Halsey took the stage. He gave the Tigers a 48-46 lead with a basket on the inside at 3:20 and they boosted the lead to five with a three-pointer with 2:51 to play. Reese Cerney hit a free throw before Feyereisen ended the run with a hoop that gave the Tigers a 54-46 lead with two minutes left. The Mustangs got back within four points on an Israel Defender three-pointer with 51 seconds remaining, but did not score again. “Luckily, when we were down four, the kids got fired up among themselves and we got some things going,” said Knudson. The win broke a four-game winning streak for McLaughlin in the rivalry. It also raised the Tiger record to 7-6. “We’re back over .500,” said Knudson. The Tigers are over .500 this late in the season for the first timesince the 2014-15 campaign. Feyereisen and Albers led the Tigers with 12 points each. Albers got hot in the third quarter with a pair of three-pointers and eight points. The pair also combined for nine rebounds. The Halsey used his five-point run for an eight-point game. Reese Cerney and Kregen Norder added six points each. Alex One Horn hit four three-pointers and led the Mustangs with a 17-point, 10-rebound, double-double. Jayden Ducheneaux scored 12 points. Defender finished with eight. The Tiger take on Chamberlain on Friday in the nightcap of a doubleheader at Mobridge-Pollock High School Gymnasium. The Lady Tigers start the proceedings with tip-off around 6 p.m. The Tigers and Cubs are meeting for the 46th time. Chamberlain holds a 24-21 lead in the series and has been on a roll, winning the last six games, including a 64-59 win in Chamberlain last year. The Cubs are 5-6 on the season. 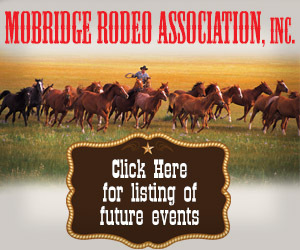 On Tuesday, the Tigers hit the road to take on a red-hot Cheyenne-Eagle Butte team. 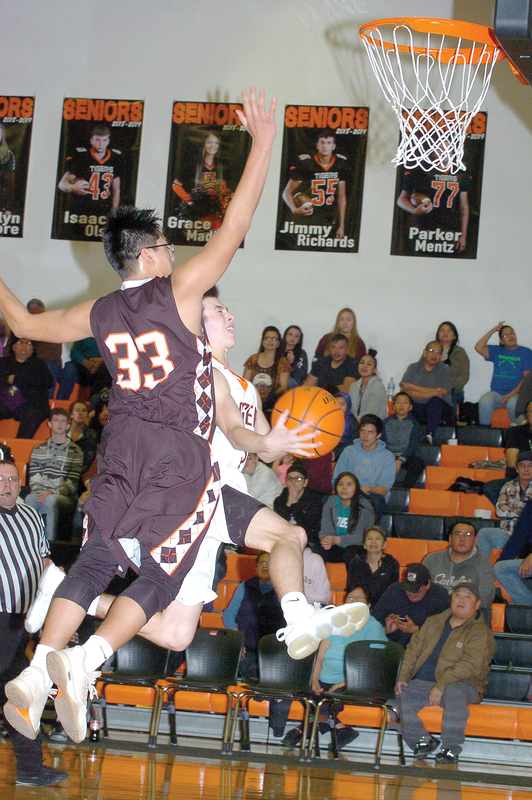 The 8-3 Braves had won six straight games before falling 54-48 at fourth-ranked Red Cloud on Monday. Tuesday’s game will be the 121st time the Tigers and Braves have gotten together. The Tigers lead the rivalry 63-57 and have won the last three games. Last year the Tigers beat the Braves 72-59 at home and 62-49 in Eagle Butte. McLaughlin: Israel Defender 3 1-2 8, Sonny Taken Alive 1 2-4 5, Alex One Horn 5 3-4 17, Jayden Ducheneaux 4 2-4 12, Elias Sims 1 0-0 2, Jonah Taken Alive 2 0-0 6, Totals 16 8-14 50. Mobridge-Pollock: Reese Cerney 2 1-2 6, Noah Feyereisen 6 0-4 12, Braxton Albers 5 0-1 12, Trace Cerney 2 1-2 5, Bryston Goehring 2 0-0 4, Braden Goehring 0 2-5 2, Caden Halsey 3 1-3 8, Kregen Norder 3 0-0 6, Totals 23 5-17 55. 3-point field goals: McLaughlin 10 (One Horn 4, Ducheneaux 2, J. Taken Alive 2, Defender, S. Taken Alive); Mobridge-Pollock 4 (Albers 2, R. Cerney, Halsey). Rebounds: McLaughlin 22 (One Horne 10); Mobridge-Pollock 26 (Feyereisen 5, Albers 4, T. Cerney 4). Steals: McLaughlin 5; Mobridge-Pollock 11 (Bryston Goehring 3, Braden Goehring 2, Feyereisen 2). Fouls: McLaughlin 15 (Ducheneaux out); Mobridge-Pollock 14. Turnovers: McLaughlin18; Mobridge-Pollock 14.